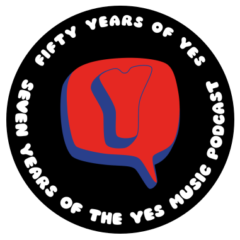 The twenty-fourth episode of the Yes Music Podcast featuring the quasi-Yes studio album, ‘Anderson Bruford Wakeman Howe’. Is this a Yes album and does it matter? No Chris Squire, no Yes? Should this have been a more permanent line up? So glad you enjoyed the show, Paul. I’m very jealous that you got to see ‘An Evening of Yes Music Plus’. That must have been amazing. The band have a history of unconventional videos don’t they? I hope you’ll also enjoy this week’s show which I am enjoying putting together now. I believe the Downes credit from Brother Of Mine is from Steve and Geoffrey writing together for Asia. I believe the song was originally called Barren Land. If you listen to Steve’s demos on his Homebrew CDs you will notice that most of the compositions from ABWH came from Steve’s demos. Most notably Brother Of Mine, Quartet and Order Of The Universe. Thanks for the information, Scott. There’s quite a bit of an Asia vibe on the record, I think. I’ll make a point of searching out those Steve demos. Hey Kevin. I’ve always assumed that the “ever piercing power play machine” was Jon’s reference to Yeswest which, I guess, he had just left, “with a vengeance”. I understand that making Big Generator wasn’t the most fulfilling experience for him! Fascinating! Yes that makes a lot of sense – and even if it isn’t true, let’s pretend it is 😉 Thanks for the comment! The only problem with that theory is that Jon’s lyrics suddenly make sense! The reference IS to Jon not wanting to chase chart success any longer, be free of the tyranny of the “power play machine”. Quite a lot of the lyrics of the album pertain to this. I’ve got quite a lot of documentation of interviews from the time and this was a clear theme. Cool! Excellent information, thanks, Andy!